Funds and Ladders: What Matters? In my previous post, First Derivatives and Second Moments, I showed, with more math than should be tolerated on this blog, that a bond fund and a bond ladder have different expected returns and risks unless they contain virtually the same bonds in the same proportions. A TIPS bond fund and a ladder of individual TIPS bonds held to maturity are rarely identical even if they have the same duration. Two things I did not show are when one is better than the other and when the difference is enough to matter. There are many factors we could use to compare ladders to funds beyond interest rate risk and return. There is the convenience issue, though I hope I have explained that tax reporting is no longer a big issue and that bond desks can do most of the legwork for you. There is the familiarity issue for those who have never purchased individual bonds. TIPS bonds aren't available for every year and some funds can be bought in smaller price increments. There are many ways we could compare bonds and ladders, but not all of them are critical. One of my objectives for this blog is to simplify retirement finance so it makes sense to most do-it-yourself retirement planners. In that spirit, I will try to unravel this issue by considering three common retirement scenarios for bond funds or bond ladders: funding known liabilities, funding a few years of living expenses, and funding a long retirement of living expenses. To simplify the explanation, when I use the term "ladder" I will refer to a series of TIPS bonds maturing annually. Ladders can be constructed with many types of bonds, but I will only refer to U.S. Treasury Inflation Protected Securities ladders. I will use the term "fund" or "bond fund" to refer to a fund or ETF that predominantly consists of these TIPS bonds. Furthermore, when I compare a fund to a ladder, I am referring to a fund with an average duration similar to the average duration of the ladder. Why do I limit the discussion to Treasury bonds when we could ladder most any kind of bond? Two reasons. First, I believe that only Treasury bonds, and especially TIPS, are safe enough for the risk-free portion of a retiree's portfolio. Second, Treasuries presumably have no credit risk, so diversification of individual bonds is unnecessary. The diversification advantage of a fund of corporate bonds, for example, would generally outweigh any advantages of a corporate bond ladder, in my opinion. If you don't buy Treasury bonds, you're probably better off with a fund for its diversification. Let's look first at the scenario of funding known future liabilities. We might wish to fund four years of a child's college education, for example. We have a good estimate of the cost and the years those expenses will be incurred. Or, we might plan to fund five years of living expenses between retiring at age 65 and claiming Social Security benefits. Finally, we might want to plan funding for 30 years or more of retirement, in which case we plan for 30 or more known future liabilities, our living expenses. If bonds aren't meant to fund a known future liability, they still have great diversification value in a portfolio. Consider a retiree whose living expenses are completely covered by a pension and Social Security benefits, but who has also saved a large investment portfolio. She will likely need to diversify that portfolio into bonds to manage risk, but holding individual bonds to maturity with no liability to match would provide little additional benefit. That need would be better met by a diversified bond fund, and one not limited to Treasury bonds. But, for known future liabilities, a ladder of bonds held to maturity has an economic benefit created by the option to hold bonds to maturity that match those liabilities. We can know with relative certainty how much they will be worth in real dollars at maturity. Funds don't provide that option. If you're investing in bonds for diversification and not liability-matching, a ladder has no economic advantage and a fund should be fine. The second scenario, such as funding the gap between retiring and claiming Social Security benefits or funding college, is a liability-matching problem, but for a limited time. I believe there are signification differences between brief liability-matching scenarios and liability-matching scenarios that could last thirty years or more. Let's consider the former. Short-duration (about 2.5 for a five-year period, in this scenario) TIPS funds are relatively safe and will not lose much in just a few years, nor do they provide much upside potential. In 2013, a bad year for bonds, iShares intermediate ETF TIP lost 8.65%, and long duration (27) PIMCO ZROZ lost 22% of its value. Short-duration Vanguard TIPS fund VTIP lost just 1.55%. In 2014, an up year for ZROZ that returned over 49%, VTIP lost 1.2%. At the short end, there isn't a lot of risk, nor is there much upside. While a ladder would seem an obvious choice in this scenario, the fact that the term of the ladder is short means that you won't do a whole lot worse in a fund and there is some potential to do better. If you can tolerate a small shortfall in the worst case, using a bond fund instead of a ladder should work fine for short periods. On the other hand, the ladder is safer and buying a five-year ladder does not entail a lot of inconvenience. The fund has sequence of returns risk. If the possibility of a shortfall is a concern, go with a ladder. The last scenario I will consider is that of funding 30 years or more of retirement with a TIPS bond ladder. At first glance, it might resemble the 5-year scenario, but funding a much longer period has important differences. I'll cover that in my next post. To summarize, if you are not trying to match a known future liability, holding bonds to maturity doesn't have a clear economic advantage over a fund. The returns and risks will be different, but we can't predict which will do better. Go with a diverse bond fund. For matching a few years of a known liability, I much prefer a ladder of TIPS bonds to a TIPS bond fund. But, in this scenario, making the wrong choice is unlikely to make or break your retirement plan. Don't lose sleep over it. A common argument that bond funds and bond ladders are identical involves their duration. Duration, though precisely defined mathematically, is roughly the number of years it would take a bond or fund to recover the capital loss from a 1% increase in interest rates (yield). An increase in interest rates would lower the price of the bond but the bond's future interest payments could then be reinvested at the higher yield and would eventually make up for the capital loss. A bond with a duration of 5 would recover a 1% capital loss in about 5 years. The argument goes like this. If the duration of the TIPS bond ladder and the average duration of the bonds in the fund are the same, then the risk of the ladder and the fund are identical. Therefore, it doesn't matter which you buy. There are a couple of problems with this argument. First, because the ladder locks in yields and the fund doesn't, their returns won't be the same unless interest rates happen to remain unchanged over time. And second, two investments with the same duration don't necessarily have the same risk. I recently had a brief chat with Professor Moshe Milevsky at York University in Toronto. I told him that I had read opinions that a TIPS bond fund with the same duration as a TIPS ladder provides equal risk for retirees. In other words, it was suggested that owning a 5-year ladder of individual TIPS bonds with an average duration of about 2.5 years has the same risk as owning a TIPS bond fund with a duration of about 2.5 years. That response didn’t help me a lot, because he seemed to be saying that he would agree that there is no significant risk difference between the two so long as I could match several risk factors. But, I could only match several risk factors by holding nearly identical bonds in both the ladder and the fund, and of course those would have equal risk. Notice what Dr. Milevsky didn't say – that it makes no difference because ladders and funds are identical. "To match all those moments, don't you effectively need to hold the same bonds in the ladder as in the fund?” I then asked. Now, that was something I could work with. I have often written that the duration of a bond is the percentage loss of a bond's value that would result from a 1% increase in interest rates, but that is only precisely correct for small interest rate movements. The real amount of loss (or gain) a bond will experience also depends on how much rates change. Duration is just an estimate of bond price sensitivity when the interest rate change is very small. I try to avoid the weeds on this blog, but please bear with me and I promise to bring us back out of them and onto smoothly-mowed lawn as quickly as possible. The following chart from Investopedia.com shows how much a change in interest rates (yield) along the x-axis changes the price of the bond along the y-axis. Duration and convexity can be calculated for both bonds and bonds fund. The red line shows bond duration and illustrates the fact that bond prices move in the opposite direction of yields. Duration is one estimate of interest rate risk. A bond with a duration of 5 will decline in value about 5% for every 1% decline in interest rates. But duration is just a first-order estimate of the impact of an interest rate change on a bond’s price. The precise change in the bond’s price as yields change is shown by the blue curve. The yellow area shows the estimation error of the bond’s duration. The larger the yield change, the greater the error. The next chart is similar, but adds a second bond. 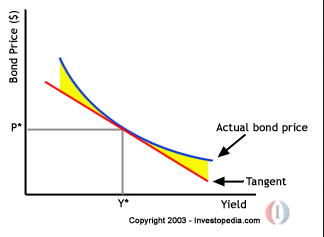 Bond A has greater convexity (a sharper curve) than Bond B. Notice the red arrow. Near the current yield and price at point (*Y,*P), the duration and convexity of both bonds are identical. But, as the yield moves farther to the right or left along the x-axis, Bond B’s price changes differently than its duration predicts. Duration predicts that the price change will be linear, but it will not be. In fact, though this simplified chart shows the curves as symmetrical, there is more error when bond yields decline than when they rise. In other words, duration is a good estimate of expected price change if yields increase or decrease just a little, but the difference (estimation error) becomes substantial if yields change a lot in either direction. Also notice that Bond A’s price (**P) changes less than Bond B’s price (**P) for the same change of yield. 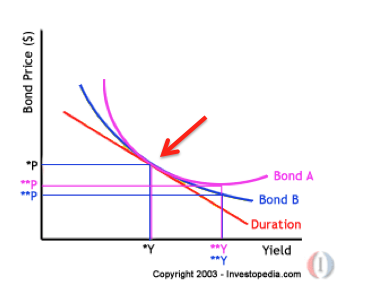 Bond A has greater convexity than Bond B. So, if your bond fund looks like Bond B and a ladder looks like Bond A, they both have the same duration but your fund has more interest rate risk. A rate increase from *Y to **Y will cause Bond A (the ladder) to fall from price *P to price **P, but Bond B (your fund) will fall farther, to price **P.
Of course, you might be comparing a ladder with greater convexity than your fund. Your fund could look like Bond A and the ladder like Bond B, in which case the opposite would be true, but the point here is only that they are different. What does this have to do with the ladder-versus-fund debate? It throws a monkey wrench into the argument that a TIPS bond fund has the same risk as a TIPS bond ladder if the duration of the two is the same. The risk is “reasonably close”, according to Dr. Milevsky, only if the convexity of the fund also matches that of the ladder. Some advisers suggest mixing funds of different durations to achieve the duration you need. Mix a fund with a duration of 4 years with an equal amount of a fund with a duration of two years, for example, to create a fund of funds with a 3-year duration. This might work for duration, depending on your needs and whether workable funds exist, but that math doesn’t work with convexity. (An excellent Powerpoint lecture explaining why can be found here.) It will be impractical to combine funds to generate both the duration and convexity of the ladder you seek to replace. And at some point, buying the individual bonds is just a lot less work. This all assumes, of course, that you can learn the convexity of a fund and that the manager will hold it steady while you own it. Bond durations are fairly easy to find online, even if they aren’t guaranteed over time, at places like Morningstar.com, but funds don’t typically even report their convexity. Here is where I honor my promise to return from the weeds. A TIPS bond fund and a TIPS ladder won’t have the same risk unless they both hold about the same bonds in the same proportion. Good luck finding a bond fund that needs the same bonds as you. A fund and a ladder can have the same price, yield and duration but if one has lower convexity, their risk is different. The intent of my post today is to dispel the notion that a TIPS bond fund and a TIPS ladder are no different so long as they have the same duration. Duration is a first-order estimate of interest rate risk. A ladder and a fund can have the same duration but different amounts of risk. Even if the risk is similar enough, they won't have the same expected return. A bond fund is not a bond ladder unless they effectively hold the same bonds. A bond fund is not even another bond fund. Intermediate TIPS bond fund IPE has a duration of 6.84, a 5-year return of 4.08% and a 5-year standard deviation of 5.54%. Intermediate TIPS bond ETF TIP has a duration of 7.62, a return of 3.97% and standard deviation 5.08. Though they are both “intermediate term TIPS bond funds”, TIP has a longer duration, similar return and 8% less volatility. We don't know the convexity of either. Because ladders lock in current interest rates and bond funds continue to track rate changes after shares are purchased, a TIPS ladder will have a different expected return than a TIPS bond fund. A fund could have the same risk as a ladder if duration and convexity match, but achieving this with mutual funds is not practical. A fund's convexity is not generally available information and, even if it were, the fund manager makes no commitment to maintain it over time. This shows that ladders and funds are not identical unless they hold very similar bonds in the same proportion, but it doesn't show which is better, under what conditions it is better, and when it is superior enough to matter. It largely depends on how you will use them. More on that next time. (See Funds and Ladders: What Matters?) And, if you don't enjoy the math, it should be more interesting. I interrupt my current wanderings through Game Theory to re-address a question I have discussed in the past regarding whether a TIPS bond ladder held to maturity can safely be replaced by a TIPS bond fund. Bond ladders can be set up in a couple of ways, fixed length and rolling. A 5-year fixed length bond ladder, for example, will be depleted in five years as each of the rungs matures. We replace the longest rung of a rolling ladder each year as the shortest bond matures, so a 5-year rolling ladder always contains five rungs. Today I'll talk about short fixed-length ladders. A retiree might use a 5-year, fixed-length ladder, for example, to bridge the gap between retirement at age 65 and claiming Social Security benefits at age 70. The key to this discussion is that a ladder of TIPS bonds held to maturity isn't a do-it-yourself bond fund. When held to maturity, TIPS bonds are risk-free assets that have more in common with cash than with bond funds. A ladder of TIPS bonds held to maturity has no volatility, interest rate risk or correlation to the stock market, nor does it have inflation risk. These bonds are a contract with the U.S. Treasury to pay specified amounts of interest in each year (the "coupon") until maturity and then return the face value of the bond plus additional principle to compensate for inflation. In other words, you will receive the face value in inflation-adjusted dollars. You have no opportunity for capital gain or risk of capital loss with a ladder of TIPS bonds held to maturity; you would have both with a TIPS bond fund. The absolute safest way to insure that you will have the cash you need for each of those five years is to purchase a ladder of TIPS bonds and hold them to maturity. That's the only way to automatically adjust your bond holdings' durations to match the dates when you will need the money. A fund manager will try to keep its duration fairly constant, at about 2.5 years for a short term TIPS bond fund, for example. That won't precisely match the ideal durations of 1, 2, 3, 4 and 5 years in our example, as individual bonds could. An investor could mix portions of funds with different durations to better match the duration of the spending, but that seems like a lot more trouble than buying individual bonds without a lot of improvement. Still, bond funds are at best an approximation of expense durations. Why would you consider alternatives to a TIPS ladder? Many people are unfamiliar with purchasing individual bonds and prefer the simplicity of investing in a bond fund. I don't find ladders difficult to purchase. I ask the bond desk at Vanguard, Fidelity or Schwab to find the bonds for me. Schwab charges $1 per bond and they all do the search for free, but I understand that some might find this daunting. You might also figure that you could receive higher returns from the bond fund if interest rates increase. That is a possibility, but how much profit can you make by investing in a short term TIPS bond fund like Vanguard Short-Term Inflation-Protected Securities Index Fund Investor Shares (VTIPX)? And, if this is money that you want to be truly safe, would you risk it to earn a little more interest? VTIPX has a duration at present of 2.4, which is about the same as a 5-year ladder of zero coupon TIPS bonds (2.5). You can expect a 1% increase in interest rates of similar duration bonds to result in a capital loss of about 2.4% with VTIPX. That loss would be recovered by the additional interest in 2.4 years, assuming you hold the investment at least that long. A 1% decline in rates would result in a capital gain of about 2.4%. In other words, there isn't a lot of profit to be earned or capital to be lost whether you invest in short term TIPS bonds or a fund made up of them. If that's the case, then why not leave the funds in a money market account or certificates of deposit? VTIPX has a current yield of 0.72%, Vanguard money market account yields are barely observable with the naked eye. You can buy a 1-year CD that pays around 1% and a 5-year CD can earn 1.8%. The answer, of course, is that TIPS bonds and funds provide inflation protection. But, how much inflation risk do we expect for the next five years? The current rate in 2015 is only about 1.8% a year and many predict that we will experience low inflation for quite some time. If inflation averages 1.8% a year, the real return on the 1-year CD is negative 0.8% and the real return on the 5-year CD is zero, so there are worse things than a 0.72% return. Inflation would seem to be a bigger concern than nominal returns at present, since most nominal returns for short term, low-volatility investments are currently near zero. Even a low rate of 1.8% annual inflation means that the dollar you want to spend in 5 years will be worth only about 91 cents in today's dollars. So, a TIPS bond fund makes sense to me right now. As I said, the absolute safest alternative is a ladder of TIPS bonds held to maturity, but the TIPS bond fund doesn't add much risk. You can't really lose much money (or make much) at this duration in a Treasury bond or fund. This is a situation in which we should probably be more concerned about not losing money than making more, anyway. A fixed length (non-rolling) TIPS bond ladder is not the same asset as a TIPS bond fund. The former is a risk-free asset and the latter has volatility of returns. 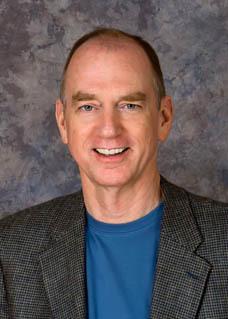 Rolling ladders and longer non-rolling ladders have other risks that concern me more, but if you want to go the more convenient fund route, I don't see a compelling reason to buy individual bonds in this scenario with today's interest rates unless very small losses would make a difference in your situation. I'll talk more about ladders and funds next time in First Moments and Second Derivatives.